Did you miss out on the joys of braces when you were a kid? Well, not getting teased about being a metal mouth may have been worth it, but now you’re an adult and wish you had straight teeth. Maybe there’s a gap in your front teeth. Maybe your alignment is off. But who wants to be an adult with a mouth full of metal bands and wires? At Cosmetic Dentistry Center, we can provide rapid orthodontic treatment for some of our adult patients, and it doesn’t involve a single band or wire. We use Invisalign. Invisalign was first developed in the 1990s, but has really taken off in this decade. It is a teeth-straightening system that uses clear plastic trays, called aligners, in lieu of the old metal bands and wires involved with traditional braces. Because Invisalign aligners are clear plastic, they are virtually invisible to anyone looking at you, even from a conversational distance. Not every orthodontic need can be addressed with Invisalign, but a free consultation with Dr. Walk or Dr. Bamel can decide if this great option would work for you. The process begins with complete jaw x-rays and impressions of your teeth. These are used to create a 3D map of your teeth and jaw. The computer technology involved with Invisalign then calculates the exact movements your teeth will need to make to move into the proper position. From there, Invisalign creates a series of clear customized aligners that are to be worn in sequence. You insert the aligner into your mouth over your teeth. At first, the feeling will be that the fit isn’t right. This is because the teeth need to be moved. 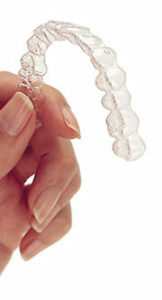 After wearing the aligner for a couple days, it will now feel like it fits because it has moved your teeth. After two weeks of wearing it, you discard that aligner and start wearing the next in the series. This process is repeated every two weeks for as long as it takes to straighten your teeth. In addition to their invisibility, Invisalign is a much more comfortable method for moving your teeth. It also makes it much easier to practice proper hygiene. When you’re eating or brushing you simply take the aligner out! And Invisalign can move your teeth faster than traditional braces, usually in six months to a year, although every patient is different, of course. Want to straighten your teeth as an adult without the stigma of braces? Call us at Cosmetic Dentistry Center, 617-965-7673, and set up a free consultation to see if Invisalign could work for you.